I always wanted to know how to make cottage cheese myself, in order to avoid many additives and preservatives in store bought ones. Cottage cheese is a delicious and nutritious addition to the diet. It is a soft, unripened cheese that is actually made with either the cream or skimmed milk from a cow: obviously the fat content of the cheese will vary, depending upon whether one uses cream or skimmed milk. Cottage cheese has a milk and somewhat acidic flavour, but it is an especially nice accompaniment to salads, fruits, dips, desserts, and even just left along as a snack. Cottage cheese was originally a by-product from the process of making butter. Homemakers allowed the cheese to curdle on its own, and sometimes they added some type of natural acidic culture to the cheese to aid in the curdling process. 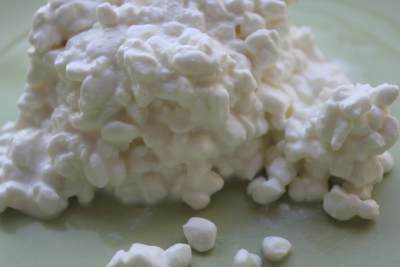 Nowadays, cottage cheese manufacturers add all different types of additives such as carrageenan and guar gum to thicken the cheese. So, instead of buying it in stores, learn how to make cottage cheese yourself. On that note, here is an easy-to-make cottage cheese recipe for that you can actually make in your own kitchen, with just a few simple and wholesome ingredients. This recipe is courtesy of Karen M.
Pour the skim milk and whole milk into the large saucepan. Check temperature with the thermometer - the milk needs to reach 120o F.
Stir with slotted spoon for about 2 minutes. During this time, the curds will start to gently separate from the whey. Cover with lid and allow to sit, undisturbed, at room temperature, for up to 45 minutes. Meanwhile, prepare strainer with dampened tea towel and bowl. Remove lid from saucepan and slowly (slowly!) pour the milk/curd mixture into the lined strainer. Allow mixture to sit to drain for approximately 5 - 10 minutes. Carefully gather the edges of your tea towel together: rinse the cloth (with the cheese inside it) for about 5 minutes under cold water, to allow the curd to completely cool. With your other hand, lightly squeeze the tea towel to remove the excess liquid (whey) from the curd. After ensuring that the curd has adequately cooled, transfer the curd to the mixing bowl. Using a fork, gently break up the curd into bite-sized pieces. Add the salt to the curd while continuing to break it up. NOTE: if you are serving the cottage cheese immediately, add the heavy cream now. If not serving immediately, transfer the cheese to a large, airtight container for refrigeration, and add cream when ready to serve. NOTE: the leftover whey liquid can be stored and used for such things as smoothies or to cook pasta or a hot breakfast cereal such as oatmeal. I sometimes add whey liquid when I'm making a creamed soup as well.